At Md7 we do a lot of training. In addition to training for specific jobs, we also put a lot of emphasis on training around our Purpose & Vision statement as well as each of our six core values. We believe that by doing so we strengthen and reinforce our culture and make the workplace more enjoyable over the long-term. in thirteen different countries in ten different languages so cross-cultural communication is very important to us. The Netherlands, introduced us to the Lewis Model. Md7 first met René during his 17-year career at Vodafone in Europe. 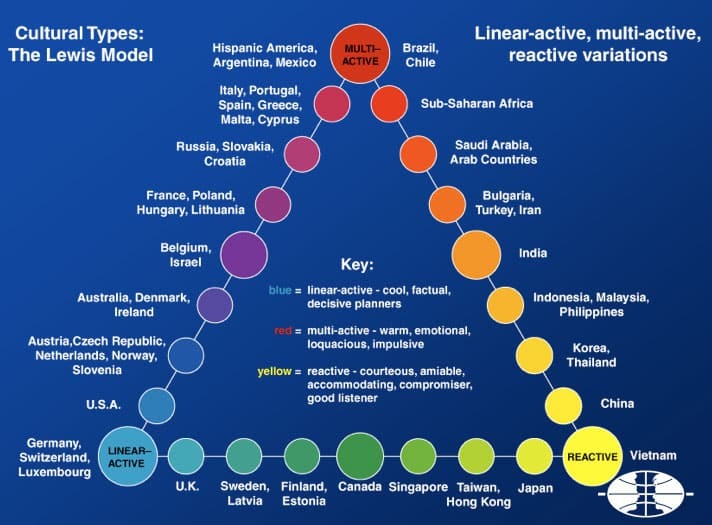 Best known for his book “When Cultures Collide”, Richard Lewis developed the Lewis Model as an attempt to help people learn to interact with people from other cultures. Currently, Md7 operates in thirteen different countries in ten different languages so cross-cultural communication is very important to us. Here is the illustrated version of the Lewis Model with more details about the three cultural types. The idea behind this training was teaching our European team members how to interact and improve their communication across the many nationalities that operate in our European offices. According to Mark Christenson, President of Md7 International, we have since experienced a greater appreciation for our colleagues, and the different cultural backgrounds that each person brings to the team in our European offices. In addition, we have begun being more intentional in trying to align our communication with customers and prospective customers in ways that align with their general culture. We have found it to be quite beneficial in our international sales effort. Pascal Bubeck, Head of Business Development for Md7 in Europe, was raised in the Black Forest Region of Germany, which is in the most southwestern part of Germany and boarders on Switzerland. Just as Switzerland is known for the excellent craftsmanship of a Swiss watch, the Black Forest region is known for its precision and craftsmanship in glass blowing and manufacturing of wooden cuckoo clocks dating back to the 17th century. In terms of the Lewis Model, because Pascal comes from this region of the world, he would be a true Linear-Active—a precise planner, who sticks to the facts and is very results oriented. Pascal often travels for business to all parts of Eastern and Western Europe including Italy, Spain and even a couple of recent trips to Moscow. These areas tend more toward the Multi-Active section of the Lewis Model. Through this training, Pascal began to understand his Linear-Active tendencies and became more aware of the Multi-Active and Reactive personalities of many of our customers with whom he interacts on a regular basis. He tailored one meeting, in particular, to focus more on personal discussions about family, something that would not be considered “normal” business practice in more Linear-Active business cultures. However, after discussing personal stories for 45-50 minutes of the allotted hour, the customer took the proposal, which had sat unmentioned to that point, and stated that it was very important and aligned with what they were trying to do and he was going to hand-carry it to his boss to ensure it received the proper attention. In other words, through application of the Lewis Model, Pascal found that he became much better at meeting the needs of Md7’s European customers by recognizing and respecting their cultural backgrounds, demonstrating Md7’s core value of Respect for the Individual, part of Md7’s corporate DNA.